T.A. Builders is a premier General Contractor providing construction management services in Central and South Florida since August 2003. 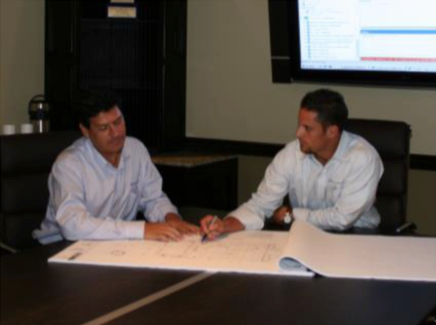 The company is recognized for delivering complex and quality projects in a timely manner. Our construction capabilities portfolio of handling diverse projects is comprised of low and mid-rise multi-family properties, specialty stores, office buildings, commercial interiors and recreational facilities. T.A. Builders officers have over 45 combined years of industry experience. The ability to establish and maintain long lasting business relationships with our clients is evidence of the high quality service T.A. Builders provide. David has over 15 years of experience in the construction industry. His main focus is field operations. He has managed a variety of projects ranging from large commercial projects to multi-family to luxury homes (design and build). David recognizes that regardless of the type of project, it is a commitment to customers service that insures the success of the project. Luis draws on his 30 years of construction experience to serve as the Company's Operations Manager. His background in field management and operations management assures perspective in both areas. Over the past 30 years, Luis has sharpened his skills in land development, residential sub-division, multi-family and luxury homes (design and build) in the Central Florida and South Florida markets. He has operated in different capacities including site manager, project manager and operations manager. Luis draws on this diversity to successfully handle the demands of pre-construction, buyout and contract management.